Hope everyone is doing well and enjoying their week so far. Halfway point tomorrow! 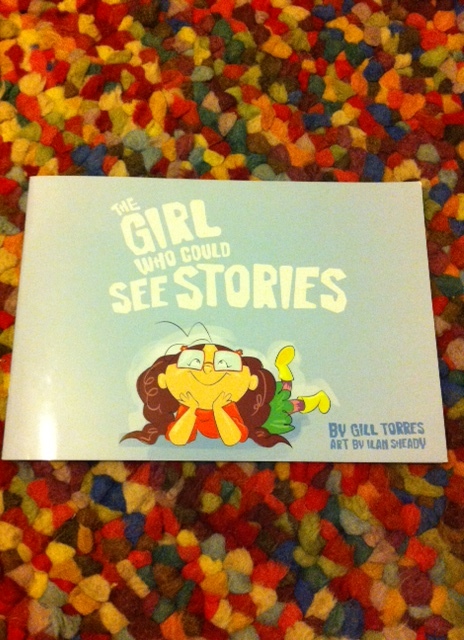 Tonight’s post is The Girl Who Sees Stories by Gill Torres.This is a special book, funded by a Kickstarter campaign, and is the story of a girl who can see stories in everyone and everything. Sofiel has a special gift. She can see stories in people running for buses, bicycles lent up against a wall and even butterflies in the sky. What happens when she looks at her plate? What stories can she see? The illustrations are by Ilan Sheady and are so adorable. Sofiel exudes personality and her dad looks really cool with his tattoos and green hair! They look so unique. You can follow the dogs through the story too! Ilan has Twitter so give him a follow to see more of his work. What story is in the burger? The story itself is very unique, we haven’t read anything like it. 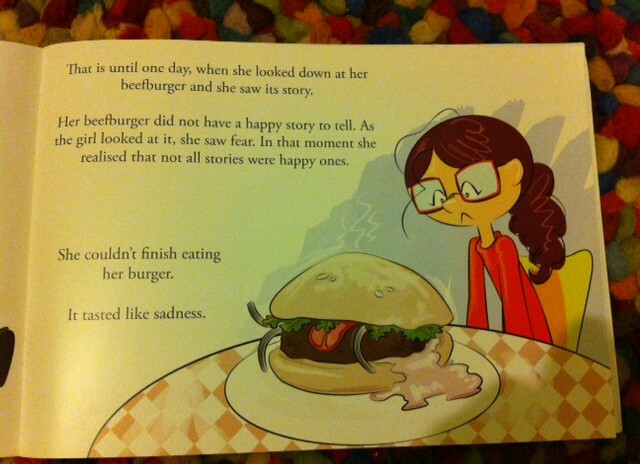 Sofiel notices a sadness in her beefburger. It is very emotive but gently approaches the concepts of plant based diets and taking care of our planet, which is quite a tricky thing to achieve. It is all too easy to not see beyond the plastic, artificial foods with additives, or to not think about how animals where kept before they were taken for food. It’s vital to talk to our children about of compassion to animals and how important it is to take care of our planet. We also liked that when Sofiel ate ‘happy’ foods, she began to feel happy herself. The book isn’t just great for families who are already vegan, vegetarian or who only eat organic products. It would also make a great tool to encourage children to eat a better diet too. The book isn’t written in a lecture sort of way, it is a very sweet story that discusses animal slaughter and ethical living in a subtle, age appropriate manner. It has been read and edited by teachers and children too, so it has been child approved! If you would like to buy the book (or any other children’s books or toys! ), take a look at Little Scribbles Stories by clicking here and entering BEEBOP20 to recieve 20% off your first order! Follow Little Scribbles on Twitter and Facebook. Gill also has a Twitter and Facebook page so like and follow for more updates on The Girl Who Could See Stories!